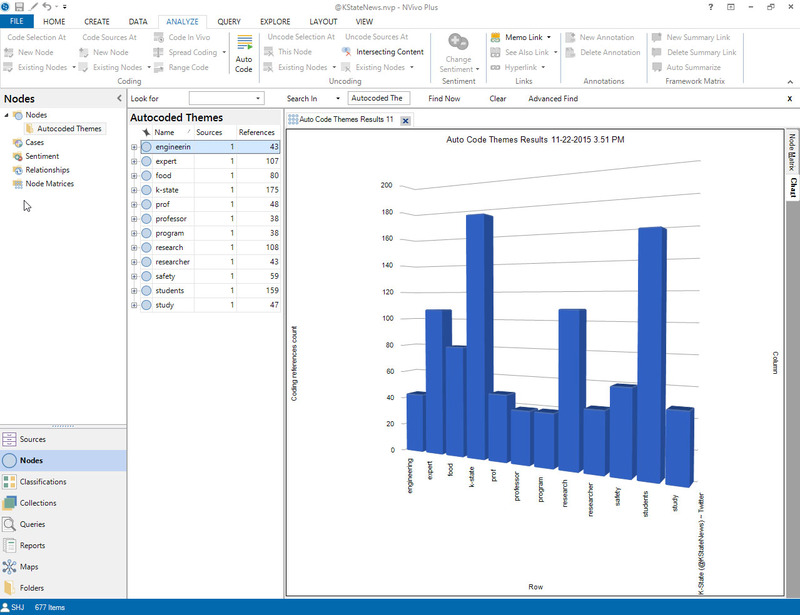 NVivo 11 Plus features some new software tool capabilities. These include the mapping of ego neighborhood sociograms (focused around a target account) downloaded from Twitter (a microblogging site). Also, there are some new autocoding features which may be applied to text documents and corpora. These enablements include sentiment analysis, theme and sub-theme extraction (topic modeling), and others. These capabilities are in addition to autocoding by text style and autocoding by existing pattern (autocoding emulating human manual coding of text-based data). 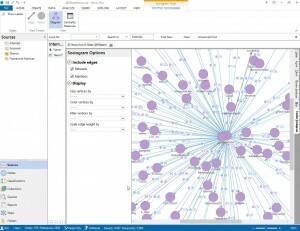 The tool enables a wide variety of data visualizations to summarize the underlying data. At the end of September 2015, QSR International changed the NVivo software tool into three different types: Starter, Pro, and Plus. 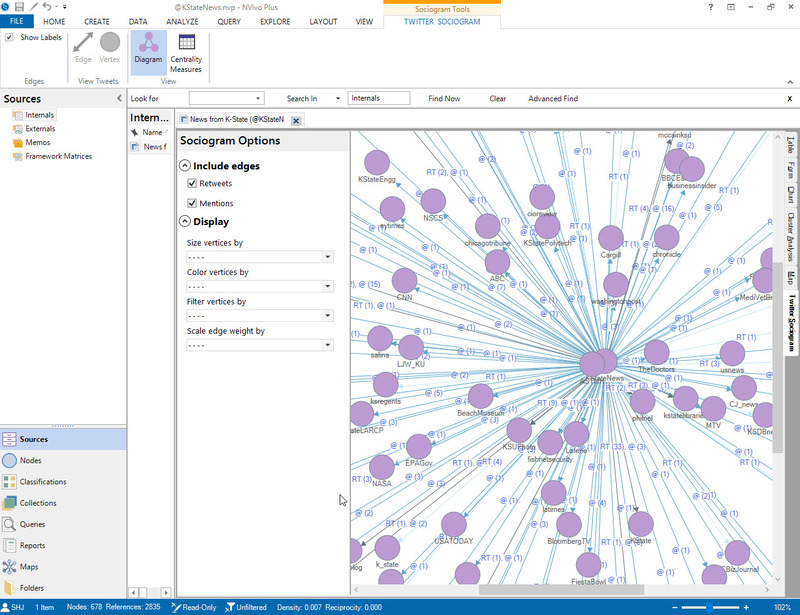 The closest equivalent, in terms of NVivo 10 capabilities, would be a mix of NVivo 11 Pro and Plus. 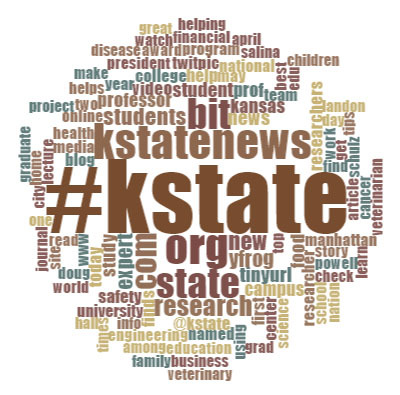 To enable K-State users to access the most advanced autocoding capabilities of the tool, the university upgraded its site license. Those who wish may download the 14-day trial software to see if they like the new look-and-feel and capabilities before changing. However, accessing this will require the sharing of personal information. Some may want to have both NVivo 10 and NVivo 11 Plus installed (on machines running the Windows operating system) and give the upgraded software a try before moving over for good. The NVivo 11 Plus can handle NVivo 10 and 9 project files, but the converse is not true (NVivo 9 or 10 cannot open an NVivo 11 project). If there are any questions, please contact shalin@k-state.edu or call 785-532-5262. What version of Microsoft Word or Office is on my computer?